It is insanity for over a month. 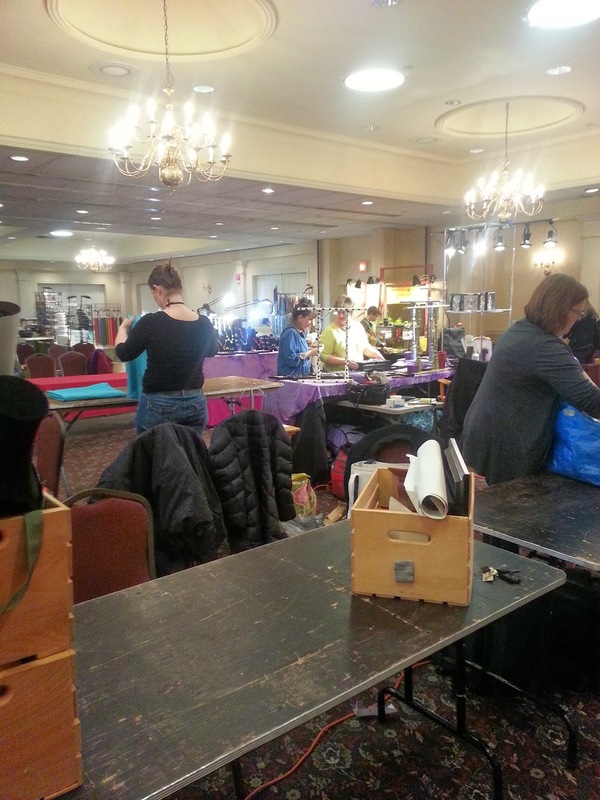 There is planning, and creating, and finishing, and prepping, and pricing, and packing......and then you are there. 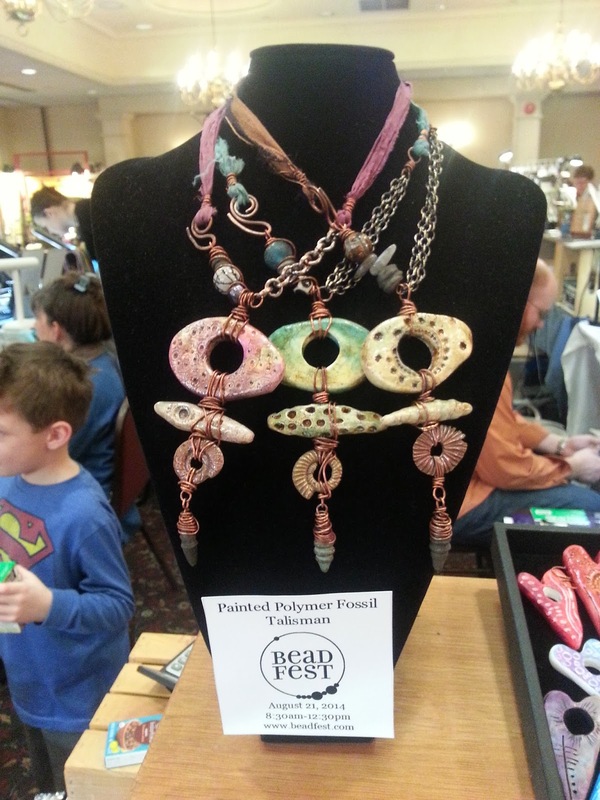 Berks Bead Bazaar was this past weekend. I am finally home, in my jammies, sitting on a heating pad, relaxing with the hubs. All I can sit here and think, is "it went so fast". There are many things that have changed in my life in the last few years, many new directions both in business and life in general. 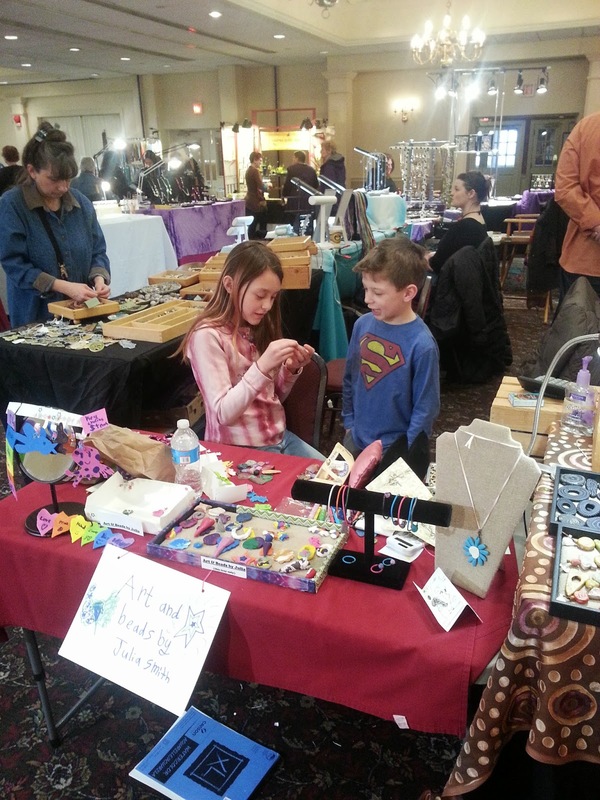 Making and selling beads, along with making and selling jewelry, well, it has seemed to complete something. 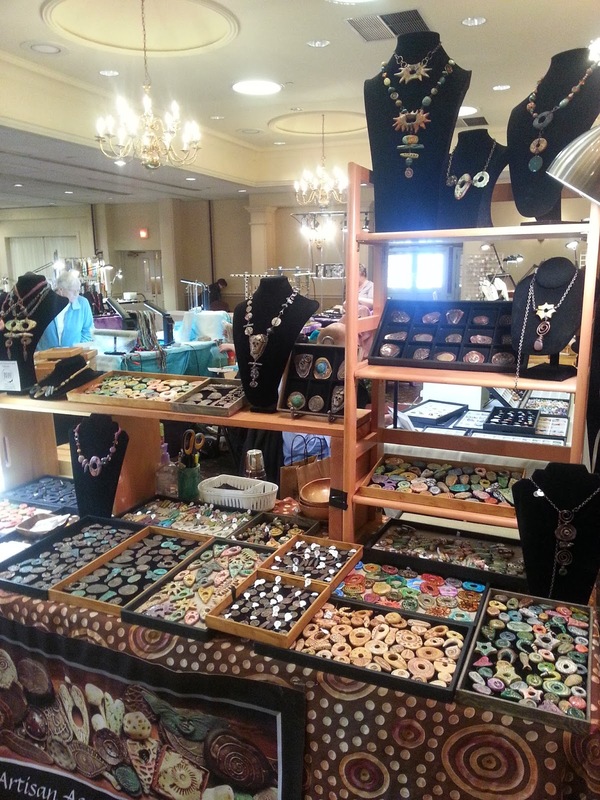 Making the decision to sell beads as part of my business was one of the most wonderful things I could have done. I feel like doing both jewelry and beads full fills something that doing just jewelry alone didn't. 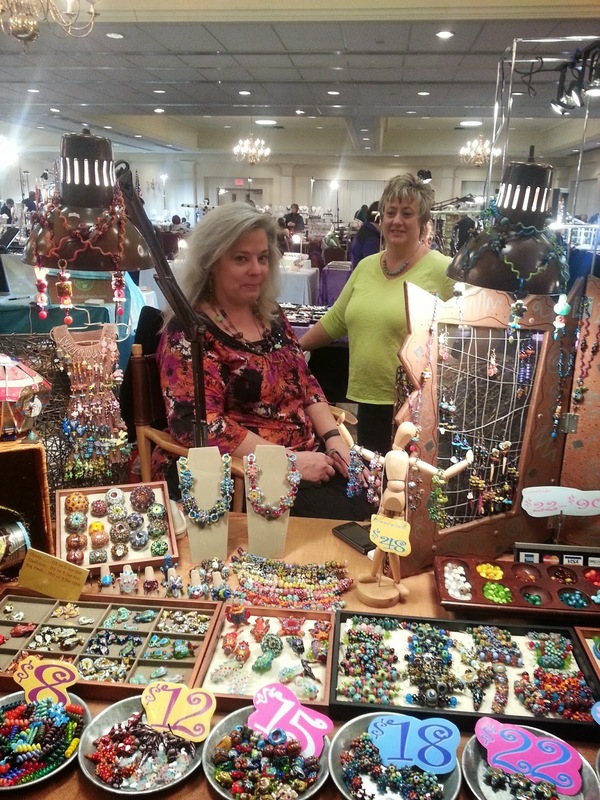 Along with taking that step, is the people I have met while making and selling beads. I have met so many kind hearted people. I have found ladies and men who have done this for years and years, who have welcomed me into this beady world, and given me encouragement and advice. I have met friends on the same path as me right now, whom I never would have found....people I can't imagine not being friends with. I have met, and become friends with people I used to deem "famous" and have bead crushes on. And then there is the fact that people like and buy my stuff. WOW! That just never stops feeling good. I love that people "get" my art. I love that it allows me to keep going, because I think my mind would collapse in on itself if I couldn't not keep making new things all the time. And my house is not big enough to just store them....people have to buy them so my kids have room to play. 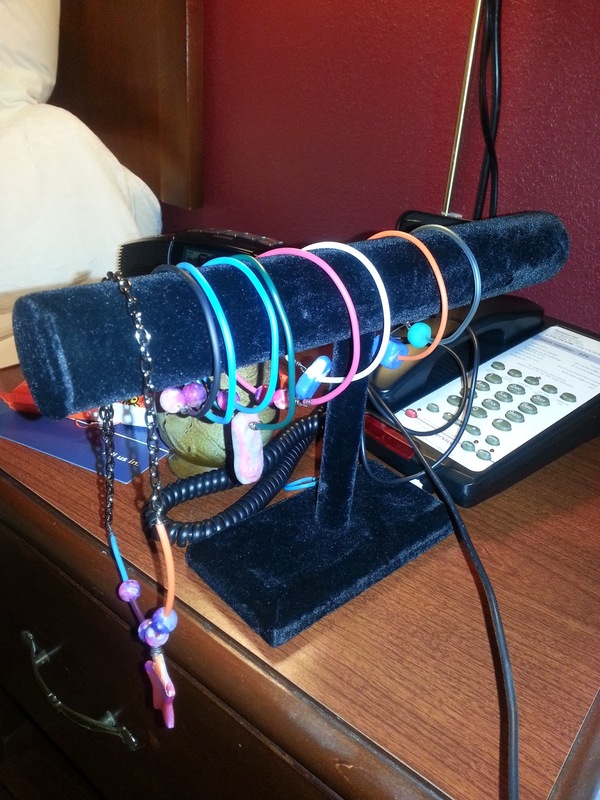 Shows are so much fun, I meet my customers, they come back and show me what they made with the beads they bought last year (I LOOOOOVE that part of it). I also get to see my beady friends. I never had a big group of girlfriends. I had one or two girl friends and then mostly guy friends. 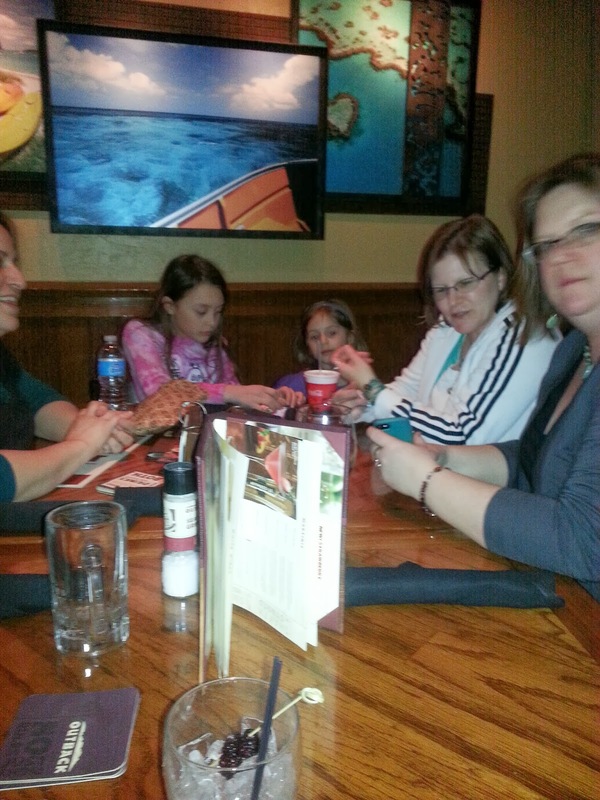 I must say, I love the camaraderie I have found with my bead friends. So thank you to my customers, both new and returning! 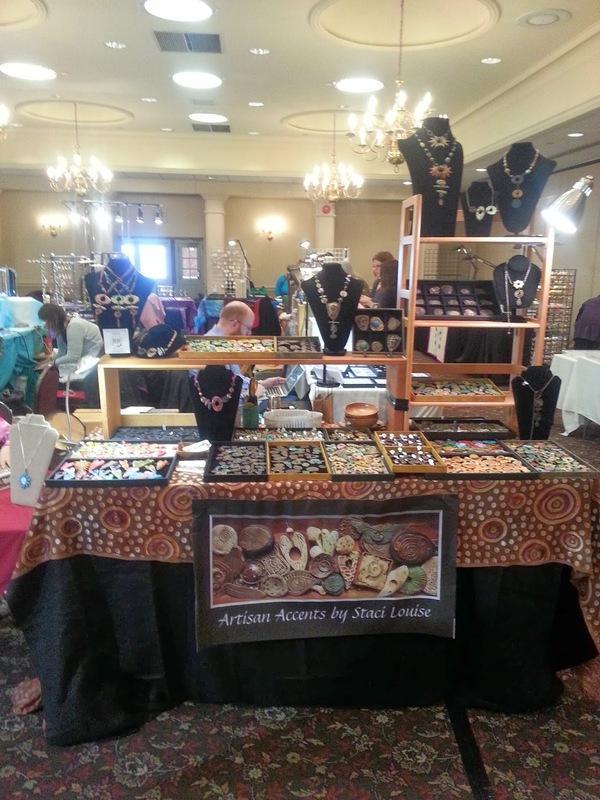 I loved seeing what you made, I love to hear what you are up to, see what awesome jewelry you are wearing and talk beads with you! Thank you for your support. Thank you to my beady girls. You all know who you are. Everyone of you mean the world to me. If you would have told me 5 years ago that I would meet friends online, and travel and hang out with them, and that they would become some of my best friends, I would have told you, you were crazy. but here I am, and you guys are. I already miss you all. Oh, and the beads. The beads are pretty awesome too. So now that I got all sappy on you, here are the pictures!!!!!!!!!! my booth all set up! 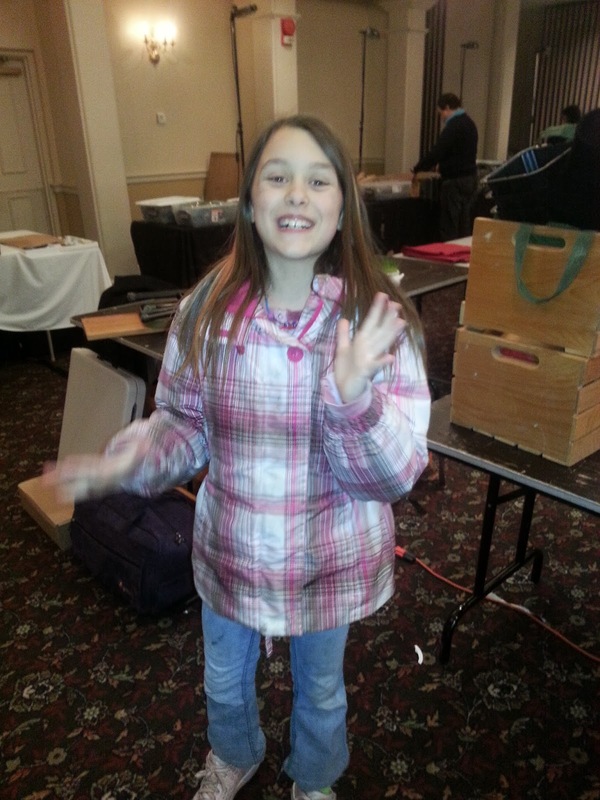 Julia with her very own table thanks to the kindness of Joan Miller. 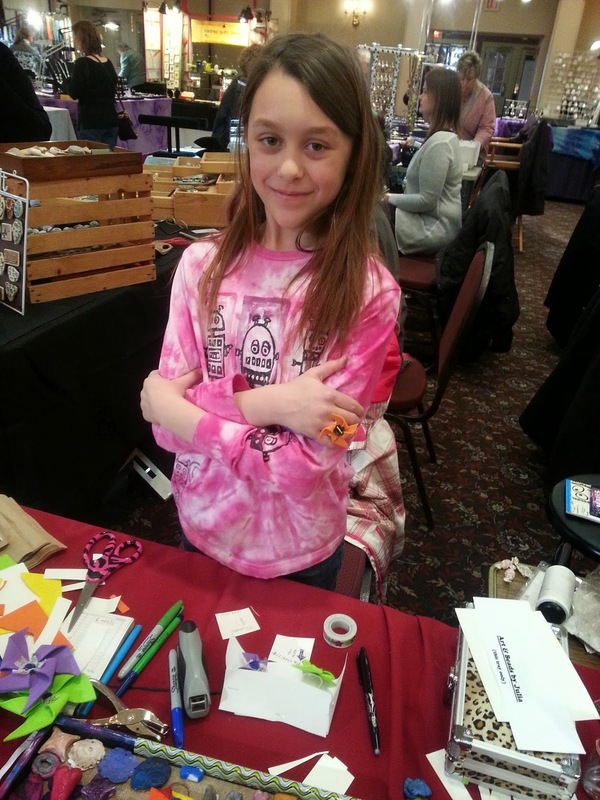 She encourages new bead artist, even at 9 years old! 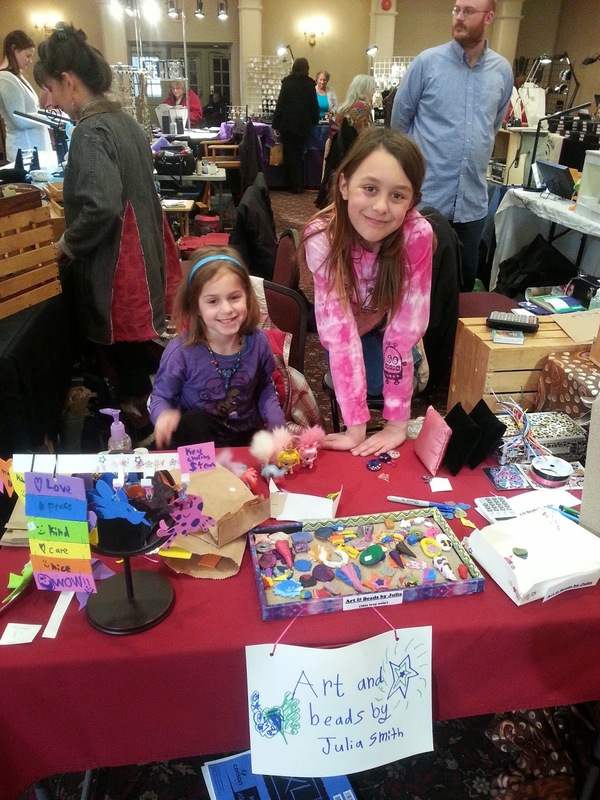 Julia and Chloe (Marsha Neals daughter) hanging out, craftin and bead shopping like old girlfriends. They have it down already. Side story. 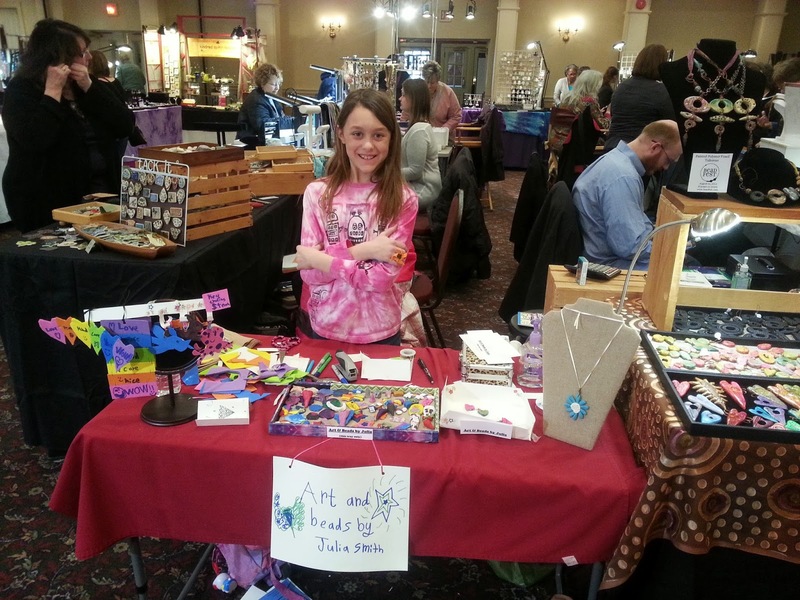 Julia makes and sells beads, and she loves to buy and hoard beads, but she has had no desire to make jewelry. 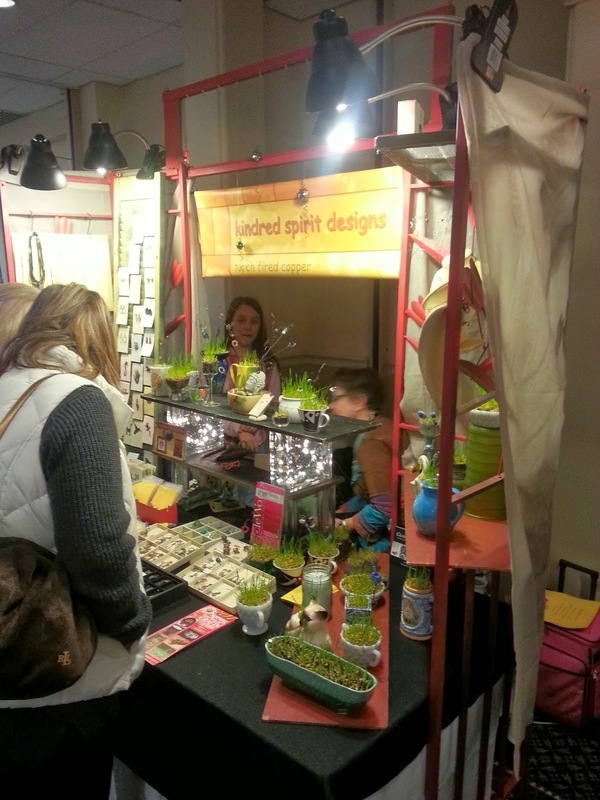 However, this year she really got check out Yvonne of My Elements booth - which is bright and fun- right up her alley- and she got some components and now she can't wait to make stuff. 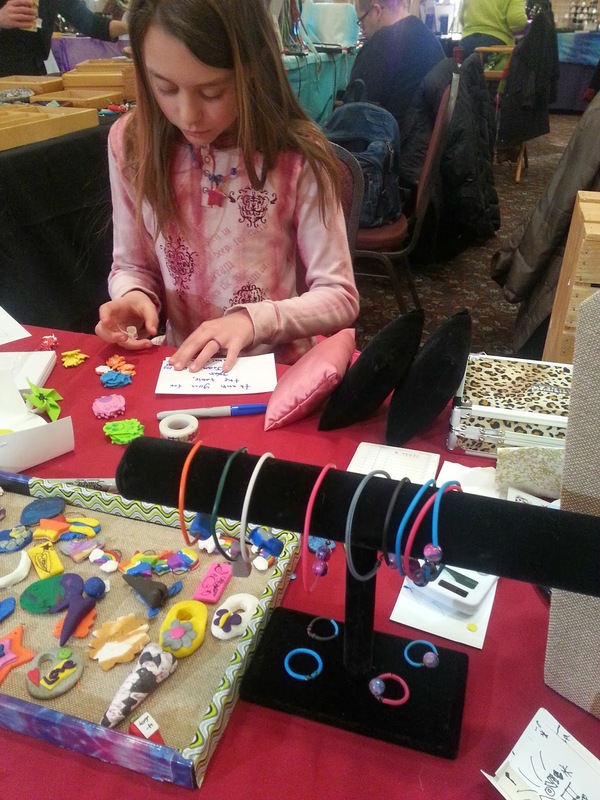 As a matter of fact, she bought a bracelet display at the show so we could make bracelets to sell the next day. 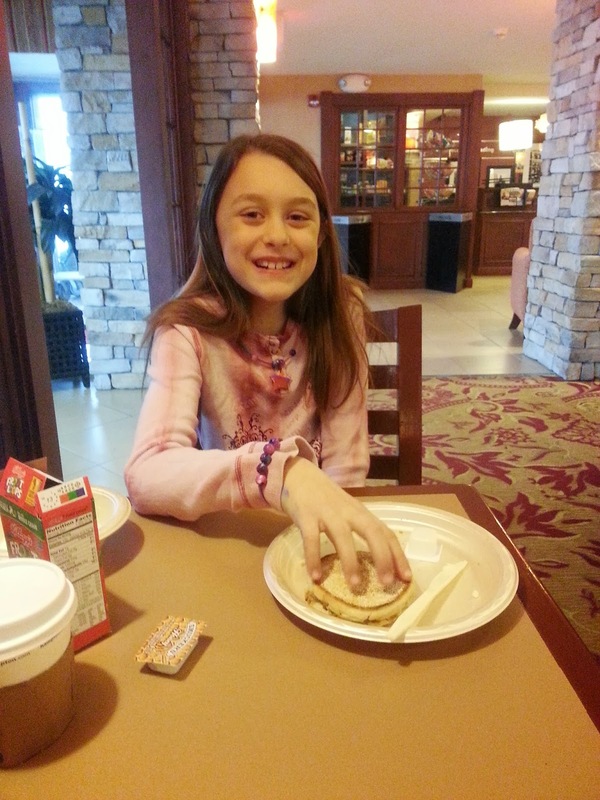 So we enjoyed some mom and daughter time making stuff saturday night at the hotel. Since saturday was a blur of sales and friends and girls and beads, I finally got around to take some better pics on sunday. 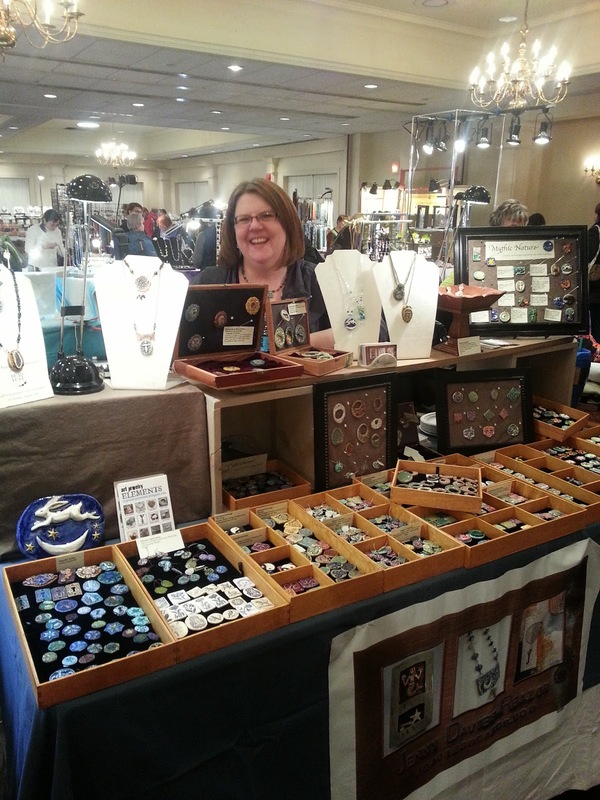 Here's Jenny at her booth!!! 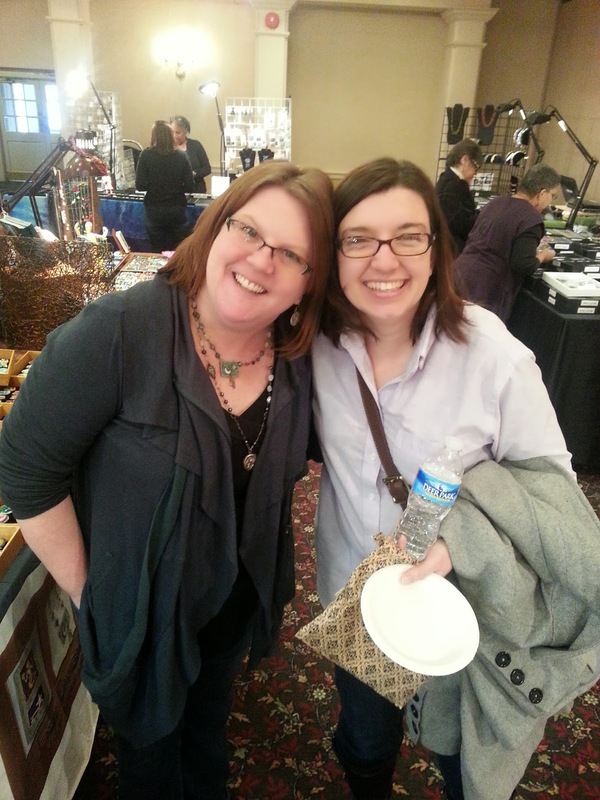 Patti Cahill of Dyed in the Fire Designs at her booth hanging out with Joan Miller. 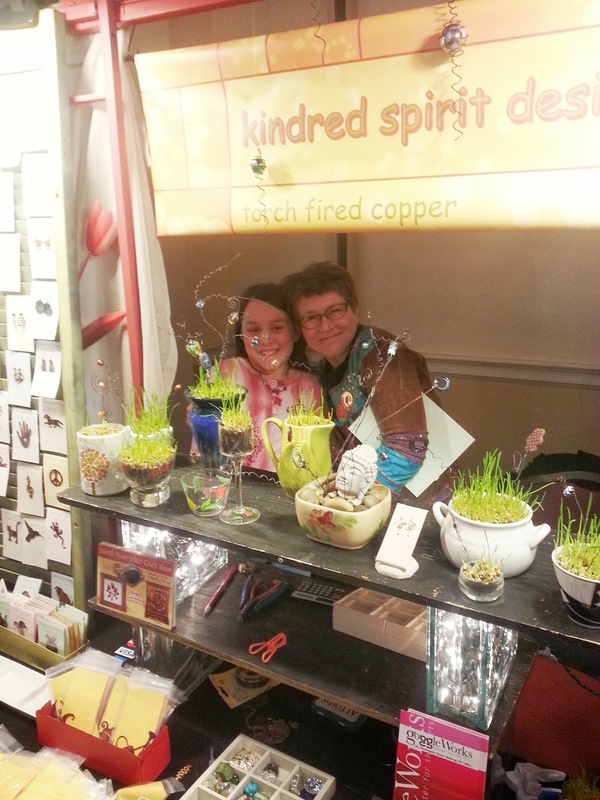 Dona Jones of Kindred Spirit Designs- she embodies her shop name, and is a kindred spirit to anyone who is blessed to know her!!! Here she is loving on my girl! Julia hanging with a new friend on Sunday. they were talking about how pretty each stone was that they bought! 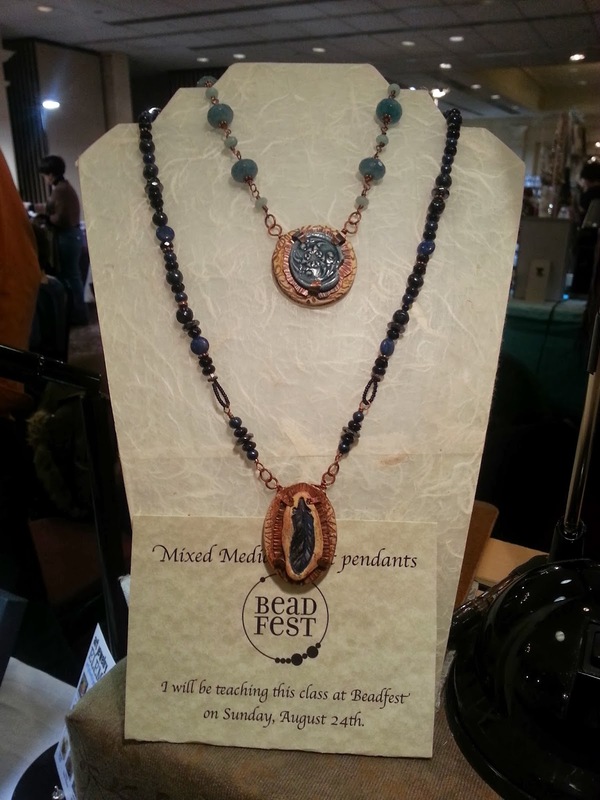 Did you know that Jenny is teaching a class at Beadfest in August? She will be making these mixed media pendants. Sally came by to shop and hang out!!!!! and just like that, it was time to pack it up. 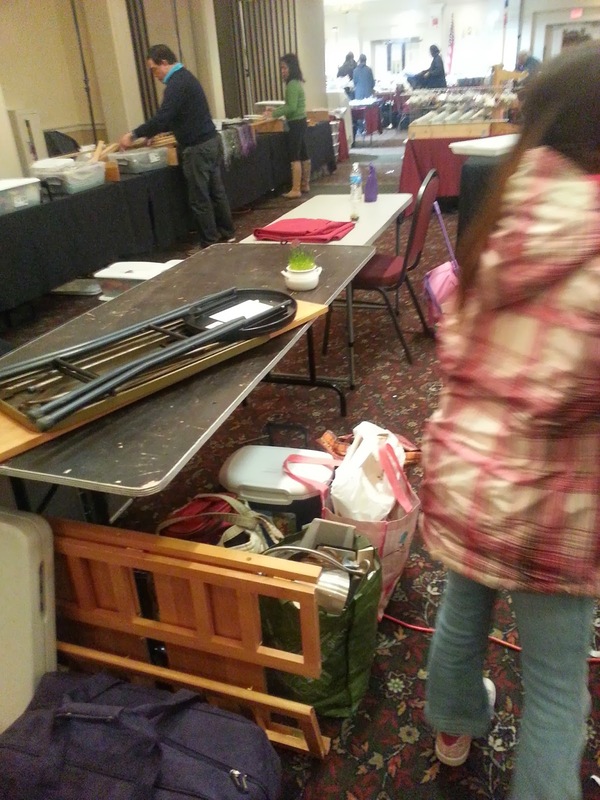 with the iffy weather- snow and sleet - barreling down on us, many of us packed it up early to beat the storm home. Julia was ready! and now I am here, ready for bed. 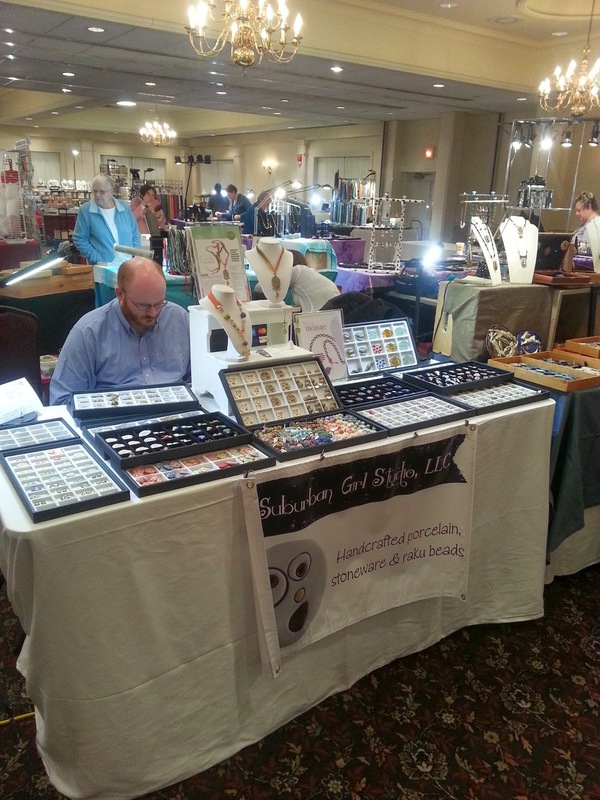 tomorrow I will get pictures of my new beads from trades and such.......and sometime this week I will be putting pictures of the bead trays online for people who want to snag some up. I am beat, and happy! time for bed...night! I thoroughly loved reading this post. It left me smiling and feeling like I had just spent some time with my beady tribe, even if only virtually. Glad you had such a great time. Sounds and looks like a wonderful weekend! 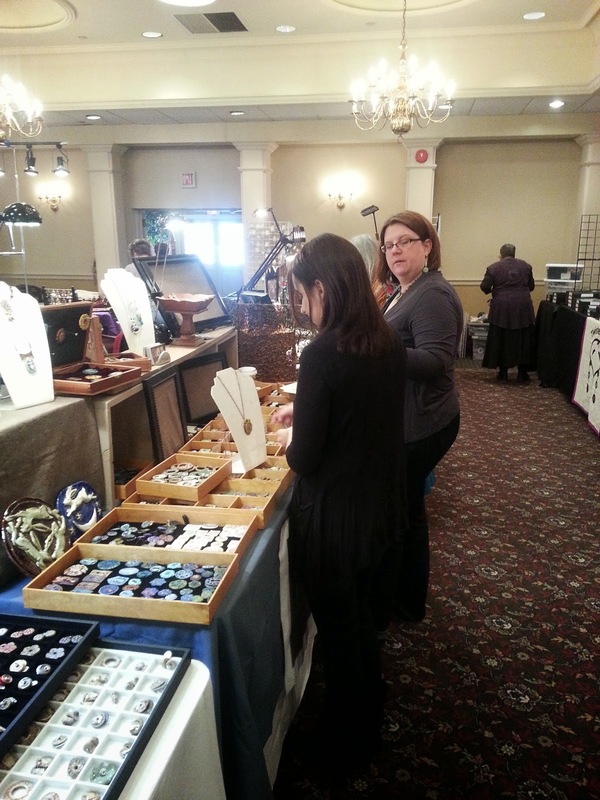 I so know what you mean about new friendships that have blossomed from beads, jewelry designing is rewarding on many levels. Can't wait until August! I am living vicariously through your posts...smiling!! Can't wait to see your new designs online. Well done, Staci! Sounds like such a good time. Isn't it great to connect face to face? What a great show, love the range (and Julia's booth as well). Looks like everyone had a fabulous time! If since its inception in 2005 the public have been somewhat unaware of the nike air max pas cher reputation Inhance has forged, clients across the globe have been taking note for some time. Among the brands the firm co-founded by Paul Prendergast and William Fitzgerald counts as partners are US retail behemoth, 2015 nike air max pas cher Best Buy; AIG; Carphone Warehouse and Virgin. Attention on that level is borne out of years of graft, a good dollop of talent combined with the air max pas cher foresight to spot a market opportunity and the ability to exploit it.